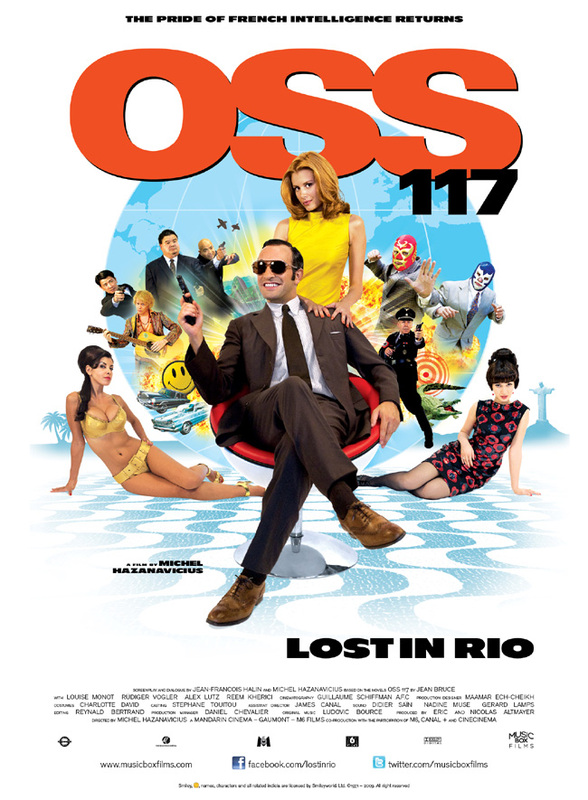 OSS 117, the suave European super spy whose first appearance predates James Bond, returns for what must be his upteenth cinematic adventure. It's the character's second since being revived as a campy parody of himself in 2006's OSS 117: Cairo - Nest of Spies. That prior film was given a limited theatrical run in the U.S. in 2008, but this one went straight to home video. Now that director Michel Hazanavicius has garnered considerable critical attention and some awards nominations for his latest film THE ARTIST, the Cleveland Cinematheque is presenting this film and its predecessor OSS 117: CAIRO, NEST OF SPIES in a special back to back program that should not be missed for fans of sixties spy flicks.. The misogynistic, borderline racist Hubert Bonisseur de La Bath (Jean Dujardin), aka OSS 117, is sent on a mission to capture Professor Von Zimmel (Rüdiger Vogler), a Nazi living in Brazil. To this end, Hubert joins forces with Israeli army Colonel Dolorès Koulechov (Louise Monot), American CIA agent Bill Trumendous (Ken Samuels), and the Nazi's hippie son Heinrich (Alex Lutz). Koulechov is disgusted by de La Bath's attitudes, but the agent just can't seem to figure out why his beautiful ally spurns his advances. And yet, despite his ignorance and piggish behavior, de La Bath somehow manages to be a likable character, even if he makes the audience cringe every other time he opens his mouth.